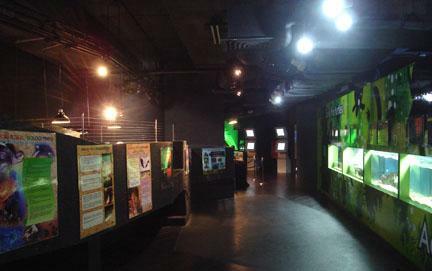 You may think that you will easily locate the Aquaria KLCC but you might be surprised. Located in Kuala Lumpur near the Petronas Towers, the aquarium might give you a hard time trying to locate it. To make things easy for you, let me give you some directions. When you arrive at the SURIA KLCC shopping center, take a lift to the basement of the shopping center. When you arrive here, you will have to turn and walk 25 meters where you will reach a sign that is written KL Aquaria above you. On arrival at this sign, turn to the right hand side and go down the long tunnel until you arrive at a car park when you reach the end of this tunnel. 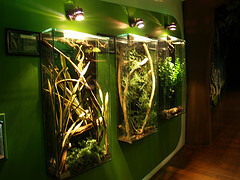 Go past the car park and you will spot the Aquaria KLCC at roughly 30 meters from where you will be standing. You will have a fantastic time with your friends and family during the school holidays or weekend when you spend your time at the Aquaria KLCC. The aquarium is so wonderful and was built based on a story from the land to the sea. The journey starts at the highlands that are heavily covered with mist and starts trailing down the rivers. It meets the rainforest and the mangroves and comes into contact with the coral reefs before finally draining into the deep sea. The journey is a long one, from up in the waterfalls and comes down the lower regions. 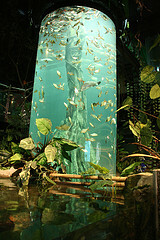 At the Aquaria KLCC, you have a chance of seeing the big cat fish that is swimming in the aquarium river. Other creatures that will remain embossed in your memory are the leaf frog that is carefully camouflaged in the vegetation, and you cant miss the poisonous dart frogs that are in the river. The mangroves are located at the point where the sea and land meet. The sea is a spectacular place where you will see the baby sharks, as well as the stingrays swimming at the bottom of the sea on the sandy bottom of the Touch Pool. The workers can also allow you to touch the pool under their watchful eyes. The corals at the aquarium are beautiful and multi-colored. They are a fine work of art made by hand. The corals are so realistic that it is difficult to notice they are not natural. Previously, only experienced deep sea divers could enjoy the beauty of the underwater view. However, the aquarium now gives you the chance to experience first hand what is underwater in the underground tunnel that measures 90 meters. You can make a stop for a closer look or simply enjoy the marine beauty of the underwater world and creatures. The workers at the aquarium also give you the show of your life as you watch them hand-feed the sharks and rays. Another spectacular view of the aquarium is a hidden shipwreck that is slowly being eaten up by the coral, which is intimidating and domineering. The aquarium tunnel is made from acrylic and is specially treated to withstand high pressures brought by the millions of liters of water that fill it. The glass is not ordinary glass. It was specially manufactured in Germany and curved into shape in New Zealand. Its final destination for assembly was in Malaysia after which it finally landed at the Aquaria KLCC. There are plenty of sea creatures, over 3000 species which are of different sizes and harmoniously live and survive in the simulated conditions in the aquarium. Some of the inhabitants at the aquarium include sharks which were brought from Singapore, endangered fresh water tortoise, popularly known as chitra-chitra by the locals that is a delicacy in popular restaurants, and the cat fish that is known for eating monkeys. Others include stingrays, eels, sand tiger sharks and other creatures. 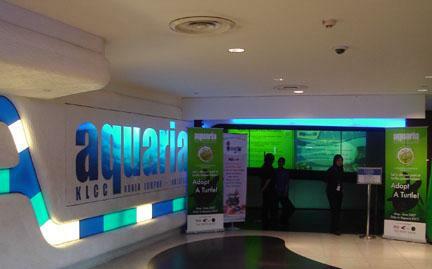 The Aquaria KLCC provides you with opportunities to enjoy yourself and learn a lot about marine life. 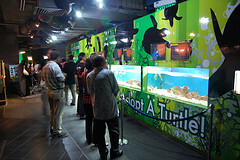 There are information kiosks that give adequate information on the sea life and its creatures. RM28 per adult with MyKad.RM22 per child from 3-12 years old with MyKid. RM38 per adult.RM26 per child from 3-12 years old. RM18 for those 60 years and above.